In 2009 the ex Mr Maddonna (otherwise known as Guy Richie), used the unlikely pairing of Robert Downey Jr and Jude Law to bring back to the screen two of crime fiction’s greatest heroes – Sherlock Holmes and Dr Watson. Up there amongst the most filmed literary characters, Holmes has been sticking his nose into other people’s business since the earliest days of the cinema (one of the first versions was a Danish short from 1908 pitting him against his arch nemesis Moriarty and Raffles, the Victorian gentleman thief – now that really would have been a showdown worth seeing). So we decided to do some sleuthing ourselves and find six of the pipe smoking detective’s best screen adventures. The results have proved anything but elementary! By the mid 1980’s there were very little directions left in which to take the deer stalker wearing crime buster. So, why not go back to the beginning? Imagining how Holmes and Watson might originally have met at school, screenwriter Christopher Columbus (before his directorial Harry Potter days) and producers Mark Johnson, Henry (‘The Fonz’) Winkler and fantasy supremo Steven Spielberg, placed Nicholas Rowe and Alan Cox as the young sleuths in suitably surreal predicaments complete with Egyptian’esque settings and bizarre flying machines, whilst trying to save a group of business men who are being mysteriously bumped off. Giving Holmes a love interest in the form of delectable English actress Sophie Ward, the film’s interestingly ‘downbeat‘ finale goes some way to explaining why Holmes remained a bachelor. After several lean years Disney was back on form with their reworking of the Sherlock Holmes myth. Clearly influenced by Basil Rathbone and Nigel Bruce’s takes on the characters from 1940’s, the cartoon duo find themselves up against the dastardly plans of Professor Ratigan (voiced with deliciously oily venom by Vincent Price) in an imaginary London reminiscent of the studio’s 101 Dalmations interpretation of the city. Guy Richie, a man who up to this point had been known for one very successful film and one very public marriage, may have seemed a strange choice to bring the character of the broody, introverted Holmes to the big screen. However his film (confronting the detective with Lord Blackwood (Mark Strong), a serial killing, occult dabbler) was a smash, perfectly casting Robert Downey Jr as a dandy with an eye for the girls in the form of Rachel McAdams, whilst perfectly at ease with his feminine side and flirting outrageously with Jude Law’s bemused and frustrated Watson. Richie took a characteristically ‘smoking barrels‘ approach to the whole preposterous proceedings without loosing Holmes’ Victorian roots, and it appears, from trailers of the new film, that he may manage it again. 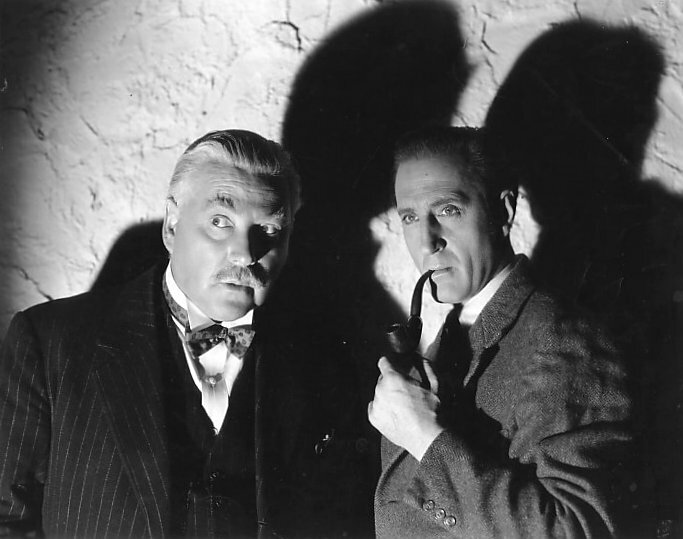 Though perhaps not the truest to the original essence of Conan Doyle’s hero, the fourteen Sherlock Holmes’ films made by 20th Century Fox and Universal Pictures between 1939 and 1946, and staring Basil Rathbone (as the good guy for a change) and Nigel Bruce, can go down in history as creating what has become Holme’s most iconic catchphrase, “elementary my Dear Watson”. The third of the films, Sherlock Holmes and the Voice of Terror was the first to be given a contemporary setting, placing the duo within a war torn Britain where the country’s morale is being undermined by Nazi broadcasts being heard on BBC radio. There is only one person of course for a puzzled government to turn to in their hour of need – Sherlock Holmes (if the great detective had really been around during World War II it probably wouldn’t have run as long as it did). The premise of placing Holmes in a modern (for the 1940’s) setting sounds like it shouldn’t work. But given a suitably foggy ambience by legendary Cinematographer Elwood Bredell and Art Director Jack Otterson, and with the addition in this story of 1940’s ‘Scream Queen‘ Evelyn Ankers as the prerequisite damsel in distress, this film, and the others in the series, are amongst the best and most fondly remembered of the detective’s cinematic outings. With a tagline like that A Study in Terror was clearly going all out for the ‘horror’ angle. The film brought together two legendary characters from Britain’s Victorian past, one real (Jack The Ripper) who has passed into folklore, and one fictional (Holmes, portrayed by John Neville) who has become so real in the public’s imagination that’s it’s often hard to believe he didn’t actually exist. That the premise of the story (Holmes is called upon to investigate a spate of gruesome murders in London’s East End by the infamous Jack The Ripper) is relatively simple doesn’t matter greatly, as it’s its depiction of Victorian London with its fog enveloped East End and panic stricken ‘ladies of the night’, which makes this 1960’s gem so memorable. Considered shocking for it’s time (it was given an X certificate by British censors due to scenes like the opening one where a young woman has a knife graphically driven through her neck), the film will also go down in history for giving us a young Judy Dench and Barbara Windsor as two of the aforementioned ‘loose women’, which in itself would be worth the admission fee. Never a studio to miss an horrific opportunity, Hammer Films unleashed one of Conan Doyle’s best loved and most unsettling Holmes stories upon an unsuspecting public. Colouring the tale of strange murders on the West Country moors with their trademark gory, technicolour style (with which they had recently reanimated Dracula and Frankenstein’s monster) complemented with a rousing score by Hammer regular Bernard Robinson, they brought Peter Cushing, in the role of Holmes (his appearances as the detective over the ensuing years would become seen as some of the screen’s best interpretations of the character), up against his frequent film adversary (and real life friend) Christopher Lee as the haunted Sir Henry Baskerville, and Andre Morell as a suitably baffled Watson.